Buying marijuana ETFs is easy and will let you invest in one of the fastest growing industries of all time. Because marijuana is now officially recreationally legal in California and Nevada, as well as Colorado and Washington, lots of investors are trying to capitalize on newfound legislation. In the United States, legal marijuana sales jumped nearly 35% in 2016 to well over $30 billion dollars. Now that weed is legal in both California and Nevada, sales aren’t expected to decrease anytime soon. Here’s the inside scoop on how you can invest in the legal marijuana industry. With more than 400 independent marijuana shops operating on California’s first day effective recreational legalization of marijuana, January 1, 2018, it’s safe to say the marijuana industry is booming. Although sales are already through the roof, this is no guarantee of what the future holds for legalized marijuana, but it certainly is a strong indication. For those wanting to get in on the marijuana profit action, MJX is the perfect (and only) ETF. Essentially, MJX is a fund that functions exactly like a stock, except it holds positions in several Canadian and American marijuana companies which are a hassle for US investors to individually purchase. 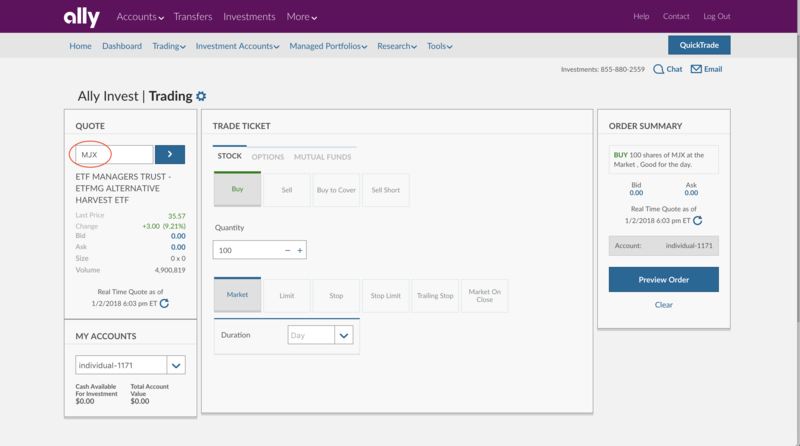 The first thing you’ll need to buy any marijuana ETF stocks is an ETF friendly online broker. The best one that we have found is Ally Invest, not only because Ally is offering free trades for 90 days, but also because Ally’s normal commissions are pretty much the best in the industry. Stock and ETF trades start at just $3.95. Plus, every Ally client gets access to robust trading platforms and 24/7 customer service and Ally never charges any inactivity or maintenance fees. Once your Ally account is opened and funded, the next step is to navigate to the online trading tab. Type in the ticket symbol, “MJX” into the the “QUOTE” box. Once you hit “enter” or click the blue arrow, you’ll see real-time prices and see buttons to buy and sell. We always prefer to use limit orders, because you get to decide what price you want to buy or sell at. A market order will execute your order at the current market price. Once you preview the order and hit the submit button, you’ll be a legal marijuana investor! These are the current components of the Prime Alternative Harvest Index, which MJX directly tracks. Therefore, the companies listed below are basically the holdings of MJX. “CN” represents the Canadian Stock Exchange and “HK” represents the Hong Kong Stock Exchange. This is another reason why MJX is an easy solution for investors looking to gain exposure to the legal marijuana industry. It would be extremely difficult and very costly to individually purchase each of these components on different stock exchanges around the world. MJX is a global ETF. Canada and the United States resemble roughly 75% of the ETF’s holdings. Depending on your view of how/if more legalization of marijuana will take place over the coming years, a global ETF can certainly be seen as a boon. As legal marijuana sales increase, so will public interest and public investment. Moreover, MJX only charges a 0.75% annual management fee (as virtually all ETFs charge a management fee, which equates to $7.50 annually on a $1,000 investment. Although it’s impossible to tell which way an investment will move, given that marijuana just became legal in California and Nevada in 2018, it doesn’t seem unreasonable to think the entire industry is just starting its growth spurt. Ally Invest offers deep discounts for high-volume and/or high-balance traders. Learn more.